Unique 3-in-1 multifunction design. Two side bag are built together and the top is detachable. Detachable top bag can be used as a backup bag for extra space. It's easy changed as a shoulder bag with included shoulder strap, the pannier Built-in PE board to reduce shock and keep shape. The bag is made of a quality 1000D reinforce polyester canvas, solid and durable,there are waterproof coating to protect your bag from rain water. Easy Installation: Easy to install on the back seat,using 3 buckles with adjustable straps and 2 Velcro straps to assemble or disassemble side bags to the rack,suggested use on bicycles with rear frame and side loads. 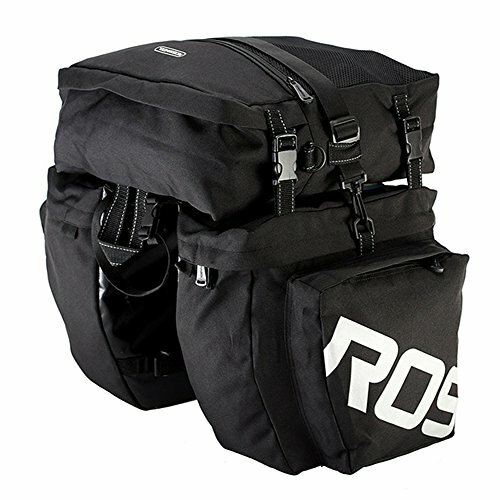 Large volume capacity up to 37L (10 gallons),It has enough room to carry cycling accessories cycling tools, every day grocery and camping gears. Reflective stripe, two side large reflective logos for better safety in low light. If you have any questions about this product by COCO, contact us by completing and submitting the form below. If you are looking for a specif part number, please include it with your message.